The change in attitude becomes clearer for each game, as Palmeiras recover confidence and might possibly end the year with some dignity. The victory against Bahia was convincing, as was the return of Valdivia, and served to definitely free Palmeiras of any risk of relegation in addition to substantially improve chances for play in next year’s South America Cup. Watch the highlights below. The sudden change in the team can surely be attributed to several factors, but I highlight two: the removal of Kleber (destination still unknown) from the squad and the arrival of football manager Cesar Sampaio. Especially the work of the latter seems to have been crucial in the lifting of morale and team spirit. Speaking of team spirit: you guys remember Lincoln, the midfielder who spent much time in the medical department and left Palmeiras for Avaí in the beginning of the Brasileirão after having been labelled a chinelinho (literally “flip-flop”; a lazy fellow)? Well, at the end of the first half of Avaí vs. Vasco on Saturday, Lincoln’s team mate Diogo Orlando approached him and called for better performance. Lincoln disapproved and head-butted Orlando while still on the pitch. In the dressing room during half-time, Orlando was in tears and lamenting the eminent relegation of his team, when Lincoln approached him to apologise. Orlando got to his feet and apparently punched Lincoln repeatedly before being pulled away by other players. Mr Chinelinho didn’t get on for the second half. Poor Lincoln *HEAVY dose of irony*. Avaí are the first team heading for the second division 2012. América/MG will only escape if they win their last two games against Atlético/PR and Atlético/GO and Cruzeiro stay put at 39 points (check out the tables to your right). Other teams running the risk are Atlético/PR, Ceará, Cruzeiro and even Bahia and Atlético/MG. My hunch: Cruzeiro and Atlético/PR join Avaí and América/MG. In the second division the final round takes place this coming Saturday. Portuguesa (São Paulo), Náutico (Pernambuco) and Ponte Preta (São Paulo) are ready for ascension. The last spot most likely goes to Sport (Pernambuco), Bragantino (São Paulo) or Vitória (Bahia). Take note: we could have three teams from São Paulo join the present four in the first division, bringing up the total to seven; that’s more than a third of the total. My hunch: Sport beat already relegated Vila Nova and keep Bragantino at bay due to better goal difference. Now back to Palmeiras. 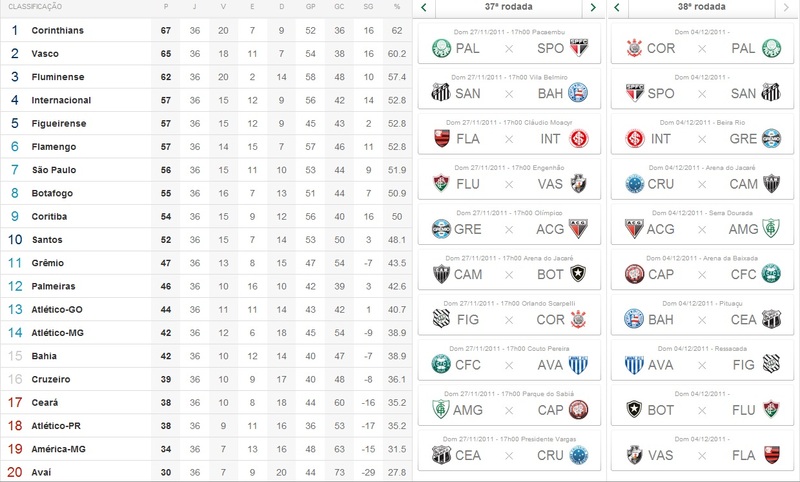 With two rounds to go, Palmeiras face SPFC and Corinthians. By the look of it, Palmeiras could have the rare opportunity to in a decisive manner contribute to depriving São Paulo of their spot in next year’s Libertadores Cup and Corinthians of the Brasileirão title. Inshallah. Considering the rather positive outlook described above one would expect calm waters at Palmeiras, with everyone doing their best to preserve the good vibe and focused on the important tasks ahead, right? It took 24 hours, or actually a little bit short of that, for the grenade to explode: president Tirone has decided to get rid of nearly every remunerated professional at Palmeiras, firing lawyer André Sica, administrative manager Sérgio do Prado and all five press officers. The decision will be formally communicated tomorrow (Tuesday) morning. Arnaldo Tirone, when interviewed by Radio Bandeirantes, stated: “There are no specific reasons for the dismissals, but no one is eternal, neither am I. I hold nothing against the services nor the people, but some things at Palmeiras will change. We are reforming things and decisions have already been made.” Sounds reasonable? Not really. But getting rid of the only remaining professionals from the Belluzzo era has always been a strong demand from ex-president Mustafá Contursi and his political allies. It’s worth highlighting that Palmeiras’ press office was considered one of the best if not the best among the Paulista teams. But hey, performance means nothing, politics is everything. Back to basics at Palmeiras. Let’s hope for limited shockwaves this time. Very well said, Kristian: “performance means nothing, politics is everything”. Its incredible such a great institution as Palmeiras is run by those small-minded bastards. Would be great if they got heavy beaten like Mr. Flip-Flops on some halftime dressing-room brawl. Now back to basics, let’s hope for two wins in the next two games to enjoy our holiday’s with big smiles on our faces. We are Palmeiras indeed !